Black And Beige Georgette Palazzo Suit. The suit is beautifully weaved together with zari and cording embroidery all over with stone work. 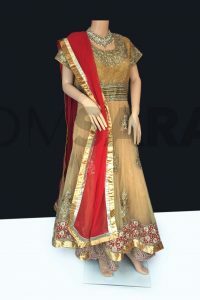 The outfit comes with a crepe silk mirror work embroidered palazzo and a chiffon dupatta.